Along with its announcement of the Galaxy Note 5 and Galaxy S6 Edge+, Samsung also announced a starting date for its mobile payment system, Samsung Pay. The service finally arrives in the US on September 28, but there will be a beta trial period for select users that opens on August 25. If you live in Korea, well, you get to start using Samsung Pay as early as August 20. At launch, Samsung Pay will be compatible with the new Galaxy Note 5 and Galaxy S6 Edge+, along with the previously released Galaxy S6 and Galaxy S6 Edge. The Note 5 and S6 Edge+ will come preloaded with the software, while the regular S6 and S6 Edge will see a software update in mid-August to enable it. As a recap, Samsung Pay could be the real future of mobile payments in that it can make payments through NFC or through Magnetic Secure Transmission (MST), which allows it to work through regular credit card terminals. MST emulates a credit card swipe, opening it up to almost any payment terminal. SEOUL – August 13, 2015 – Samsung Electronics Co., Ltd., unveiled today that Samsung Pay, a secure and easy-to-use mobile payment service that can be used to make purchases nearly everywhere cards are accepted, will launch in Korea on August 20 and in the U.S. on September 28. Samsung plans to roll out the service in the U.K., Spain and China, with partners to be named in each market. Samsung Pay will be preloaded on select Galaxy S6 edge+ and Galaxy Note5 devices and a free software upgrade will be rolled out beginning mid-August, to enable Samsung Pay on Galaxy S6 and S6 edge devices in the U.S. and Korea. Select U.S. users of Galaxy S6, S6 edge, S6 edge+ and Note5 will be able to participate in a beta trial from August 25 ahead of the September 28 launch. SAFE: Samsung Pay uses tokenization, Samsung KNOX, and fingerprint authentication to provide secure payments and reduce the security risks inherent to plastic cards. VIRTUALLY ANYWHERE: With Magnetic Secure Transmission (MST) and Near Field Communication (NFC) technologies, Samsung Pay works with most existing point-of-sale (POS) terminals. That means it’s the only mobile payment service that works virtually anywhere you can swipe your credit card or debit card. Samsung Pay continues to strategically expand its partnership ecosystem to provide greater flexibility, access, and choice for customers. 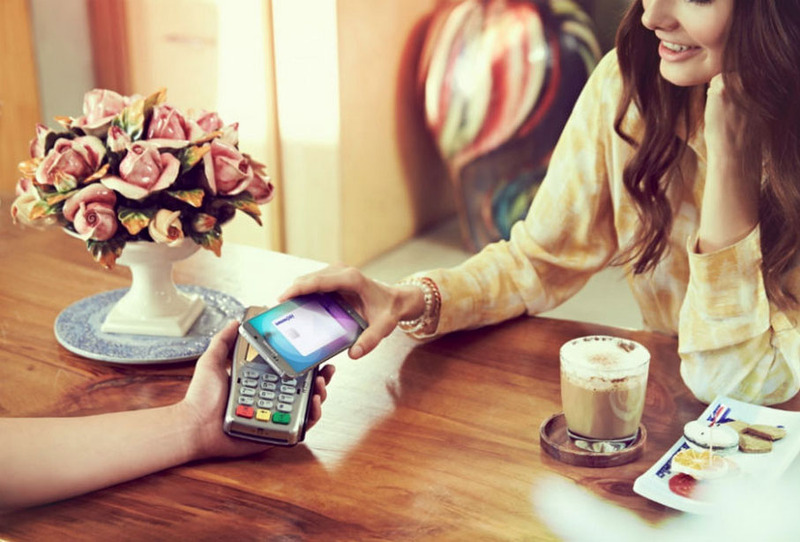 Samsung anticipates working with payment networks such as, American Express, Discover, MasterCard and Visa, major banks including Bank of America, Chase, U.S. Bank and key financial partners including First Data, Synchrony Financial and TSYS to extend Samsung Pay to the U.S. Samsung anticipates working with all major Korean card companies including Samsung Card, Shinhan Card, KB Kookmin Card, Hyundai Card, Lotte Card, NH Nonghyup Card, BC Card, Hana Card, Woori Card and Citi Card. “Samsung Pay will give our customers another convenient way to pay with their Chase cards,” said Gavin Michael, head of Digital for Chase. “As consumers increasingly rely on their mobile devices in their everyday lives, MasterCard is pleased to partner with Samsung to bring Samsung Pay to our cardholders around the world. Using advanced tokenization technology from the MasterCard Digital Enablement Service, we’re delivering a digital payment experience that is both simple and secure, and includes all the benefits and guarantees of a MasterCard transaction,” said Cheryl Guerin, Group Executive, MasterCard. Margaret Keane, president and CEO of Synchrony Financial (NYSE: SYF), the largest provider of private label credit cards in the U.S., noted, “This is great news for our customers who will enjoy the benefits our cards offer when they choose to make easy and secure mobile payments with Samsung Pay. It is also important for many of our retail partners who can use their existing point of sale devices to deliver secure mobile payments and a seamless customer experience at more than 300,000 locations.”  Based on purchase volume and receivables according to issue number 1,062 of “The Nilson Report,” dated April 2015 (based on 2014 data). Samsung Pay is a simple, safe and available virtually anywhere you can swipe your card mobile payment service from Samsung Electronics. Combining NFC with Samsung’s proprietary MST technologies, Samsung Pay provides consumers a way to pay nearly anywhere you can swipe a card at millions of merchant locations worldwide. Samsung continues to strategically expand its partnership ecosystem for Samsung Pay to provide greater flexibility, access, and choice for customers while enabling an easy and safe payment experience.